I have known this family for 7 years now. And although the Mom and I are very different women, I feel like we’ve been on the same journey as our families have grown and we have gotten older. Their story inspires me because they had a dream of living life with love and children, and they did whatever it took to make sure it happened. When Marlise (mom) and I first met, she had one child and they were actively trying to expand their family. They had many challenges that kept that dream from happening, but Marlise never gave up hope. She continually believed that God would give her more children. Obviously, she was right. I photographed them when the twins were in their first year too. When you’ve read everything here, feel free to scroll back up and look back at the Crazy Fun they had while they were still babies. And this little 3-year-old, is part of the proof of her faith and love. He is a determined but gentle child, who has the most infectious smile. Their oldest daughter, giving her father cuddle, used to be into everything. But as children do, she has grown up into a kind and reserved young lady. This little girl was in command throughout our entire time together. She is fighting some pretty serious health issues, but you would never know it. She has more energy and vigor than a tiger and was full of laughter and cheers from beginning to end. Like most parents, the last time these two had a portrait taken together was before the kids came along. Many parents don’t want to stop and take the time to get their picture taken without the kids, but I remind them that this image isn’t for them. This image is for their kids and grandkids years from now. Mom wanted me to create an image for each of the kids that touched on their own personality. Something that was just for them. So for their 8-year-old, I brought out her inner fairy, gently ushering in the peacefulness of winter. The twins needed something completely different. This little man was “one with his sword” through most of the afternoon, so casting him as the hero of Jack and the Beanstalk allowed for his bravery and self-confidence to shine through. I truly believe this young lady is going to move mountains when she grows up. But for now, commanding giants seemed very fitting. 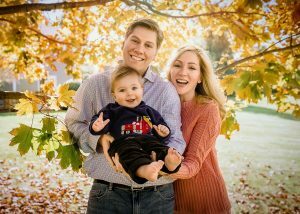 Bringing out the personality of each of your children is what makes a family photography session special. If you would like to get photographs of your family and capture who they are already, contact me to chat about it. Spring is on its way and my calendar has a few open spots that can be yours.